Mr Joe, although born in Tamil Nadu, is a Bangalorean by heart. 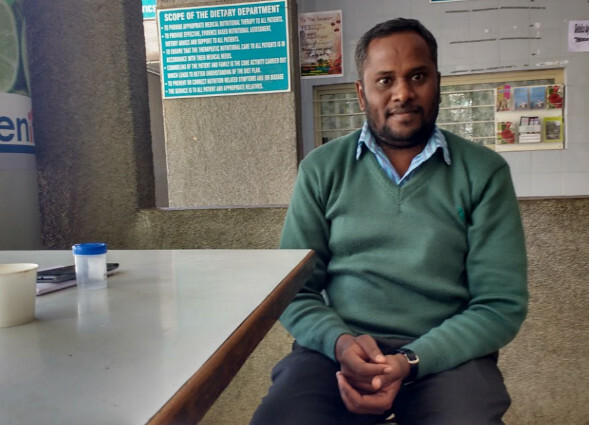 To make both ends meet, he works as a sales person for the past seven months in a small private firm at Shantinagar, Bangalore. However his earnings is barely enough to run a family of four. Joe married Divya five years ago and was blessed with a baby boy, Jonathan in 2013. However they desired for a second child since both the parents had a baby fever for a girl child. 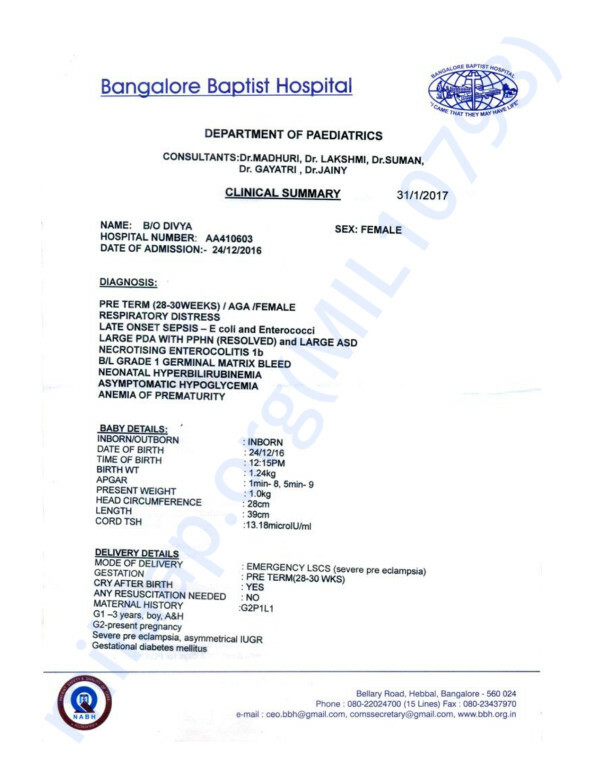 But before they could celebrate the joy of a baby girl, she was transferred to the Neonatal Intensive Care Unit (NICU).On 21st December 2016, Divya went for a casual 7 months scheduled checkup, with a slight abnormal swollen face. 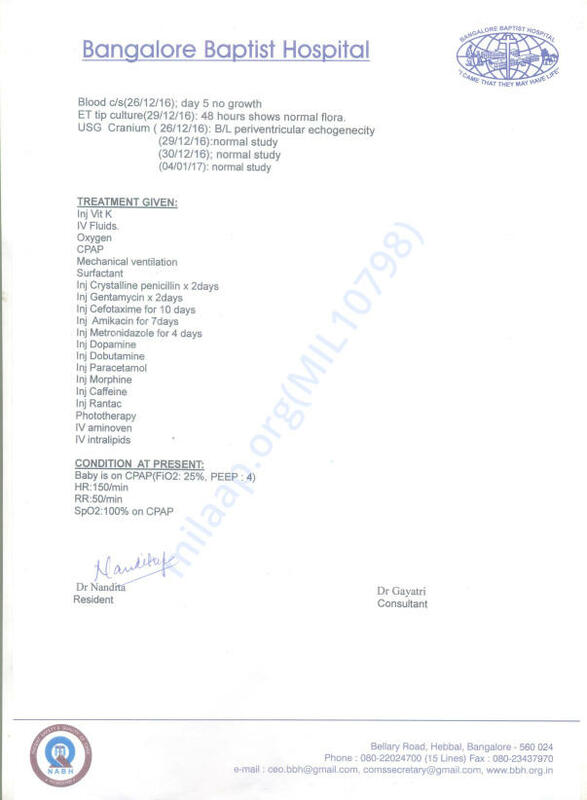 The doctor diagnosed her with extremely high Blood Pressure (190/110) and was advised to get admitted at Church of South India Hospital immediately. But after prolonged unsuccessful efforts, the BP did not normalise and she was referred to another hospital, Bangalore Baptised Hospital. On 23rd night, she went into labour, almost 2 months before her due date. 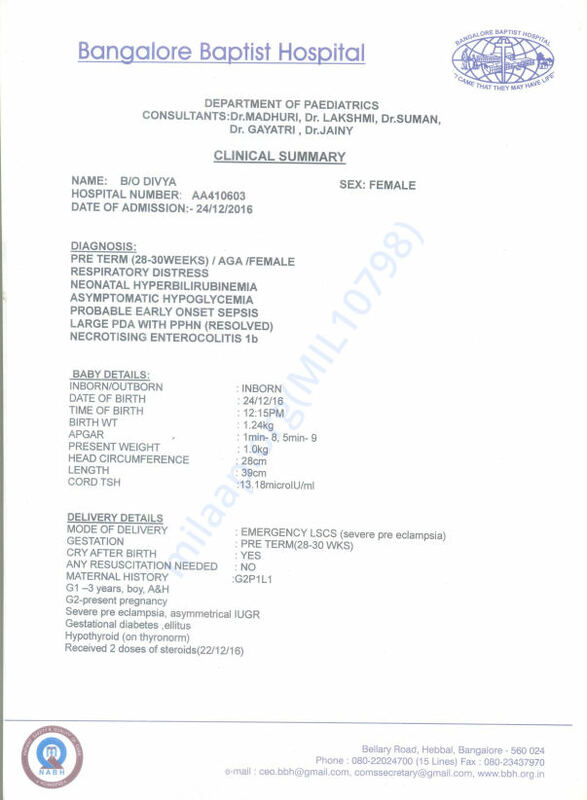 Although the doctor operated Divya with multiple complications, they were gifted with a girl child at 12:15 noon. However, the baby was shifted to NICU, much before her parents could enjoy a glimpse of her. 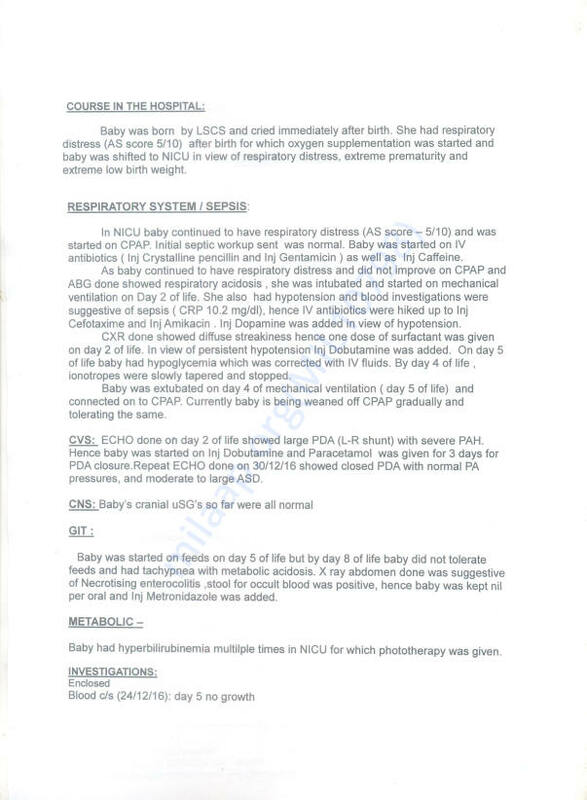 What not the baby suffered from: underweight, lung infection, followed by intestinal infection and also bleeding brain. She has already undergone two cycles of blood transfusion much before she could turn a month old. Presently the child is suffering from heavy breathing problem also. Everyday, the parents have a counselling session with the doctor regarding the health of the baby. "I am extremely broken. I tremble in fear to know about any new more complications my child has to bear. This daily morning sessions have turned out to be my fear factor", said the father. Mr. Joe earns 18000 per month and his wife is a homemaker. The baby needs medicine worth upto rupees 4000 daily. The doctors have given an estimation of 7 lakh rupees to continue her treatment and needs to be admitted till end of February in case of no more complications. Till now they have incurred expenses of almost two and a half lakhs for the baby's medication and NICU charges.Her family is finding it really difficult to arrange money for the infant child. Joe and Divya have sacrificed almost everything to save their child. A small help from ends will ease the suffering of this family. Please donate now and help Joe. 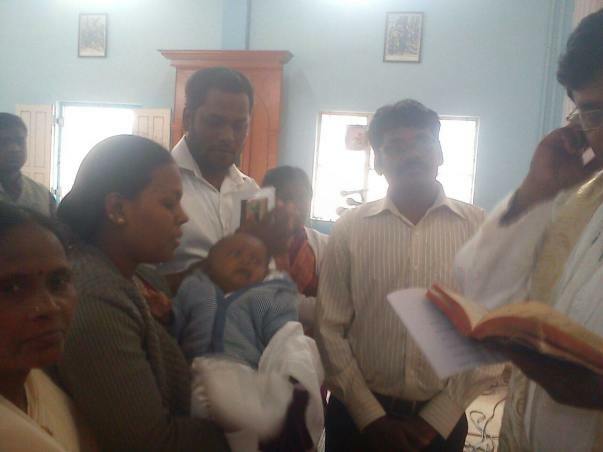 Divya & Joe together with godparents, invite you to witness Baptism of our daughter. For further details please email me on mail2joekumar@gmail.com. I am Debotri, an open fellow at Milaap. I have something extremely good to share today. Yesterday it was around 9:30 pm when I got a call from Mr Joe. “Madam, my baby will be shifted to the general ward tomorrow afternoon. I have not seen her properly ever since she is born. I am too excited to see her”, he said. The timely support and contribution from the donors were the only hope for the couple to make it through this nightmare. They have thanked the donors in the biggest way possible. Joe could not even speak properly over the phone since he was extremely emotional and happy. And all this was possible for your helping hand. Thank you once again for coming forward and helping this tiny baby to fight the battle. We will soon post a picture of the baby and keep you updated about her health. I am Debotri Roy, an open fellow at Milaap. I have a great news to share about the baby's health. 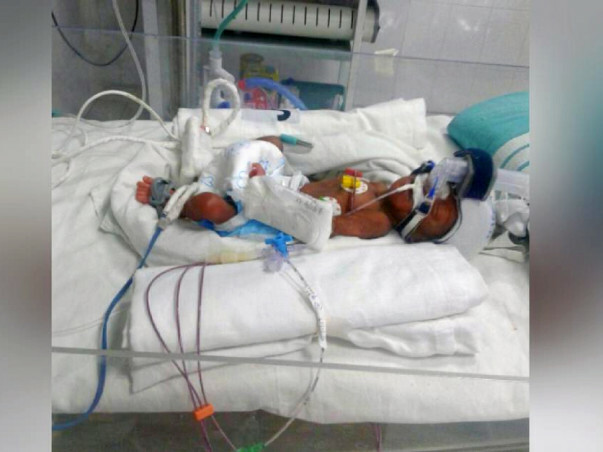 Although the baby is still in Neonatal Intensive Care Unit (NICU), she is recovering fast. "My baby is responding for the past couple of days. She cries, moves her hands and legs and is presently quite active. This is all possible because of you", said the happy father, Mr. Joe Kumar. The doctors were successful in closing the hole in the baby's heart. Apart from this, the lung infection is improving. Although the bleeding from her brain still exists, it will only improve when she recovers from the breathing trouble. There is also a gain in the baby's weight and currently, she weighs 1.34 kg. The doctors are under the impression that within the next 2 weeks, the child will weigh up to 1.6 kg after which she will be transferred to the general ward. "Two months before, I was about to lose both my child and wife. I was almost broken down. And now, I am happy to inform you that they both are in safe zone. The donors have not only supported me financially but also emotionally", said Joe. Thank you once again for coming forward. We will keep you posted on the baby's progress.